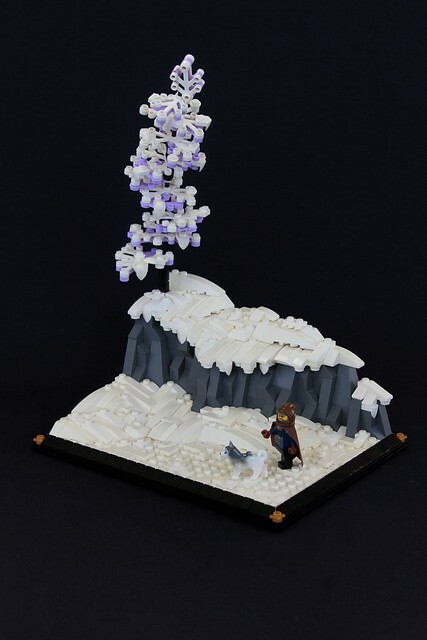 Snowy landscapes are one of my favorite things to build, and they are something you don't see all that often in the LEGO community. 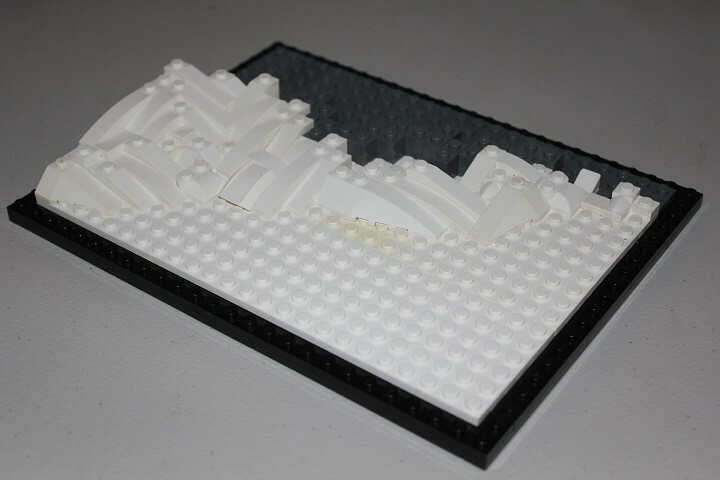 Keep reading to see how I generally build my snow-scapes. For this example, I'll show 3 different techniques for snow that I often use. Heres a simple base to work off of, the dark bley marks where some rockwork will go, and naturally the white plates indicate snow. 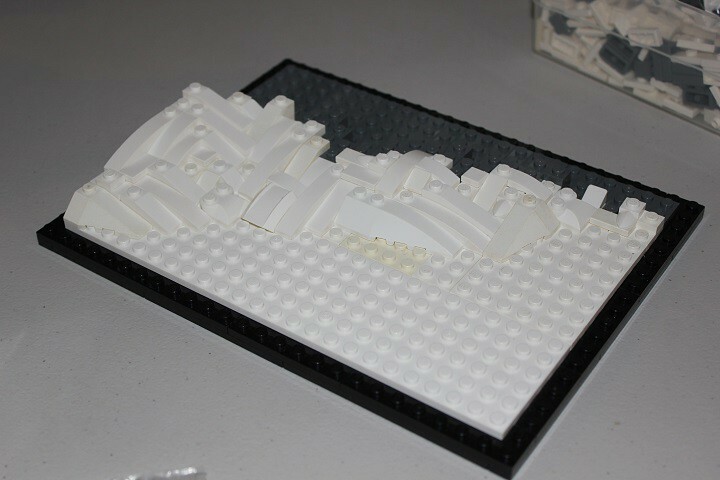 Now the snow construction begins. I want a good sized drift in the back corner so I start laying out some slopes marking its edge. You want subtle stepping going on between each slope, and you can see that on the right Ive oriented a slope perpendicular to the others. Its good to do this occasionally to break up monotonous patterning. 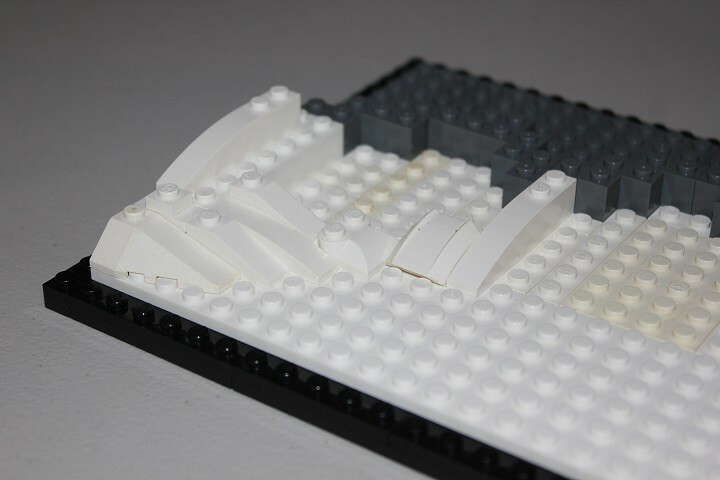 That particular 2x2 curved slope is especially useful in snow-scapes as the front lip hangs over one half stud, giving a nice change from all the whole stud steps. Not only do I step slopes forwards and back, I also raise them slightly when appropriate. 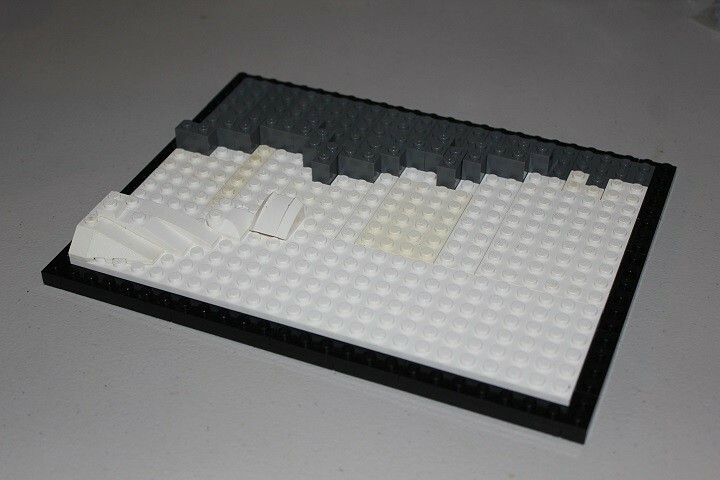 For instance, the 1x3 slope on the left here is raised 1 plate to continue the snowdrift. 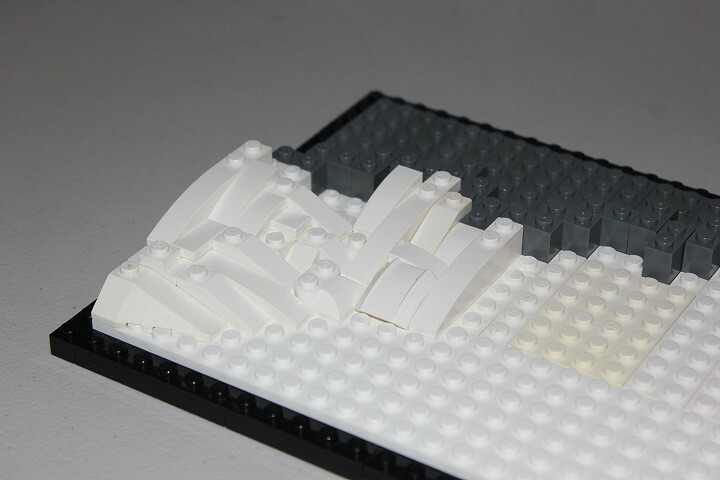 I like to include a mix of studs and tiles in my snow, and using a jumper plate to center 1x1 plates can give a nice offset. This is visible on the left, just above the 2x4 wedge slope. 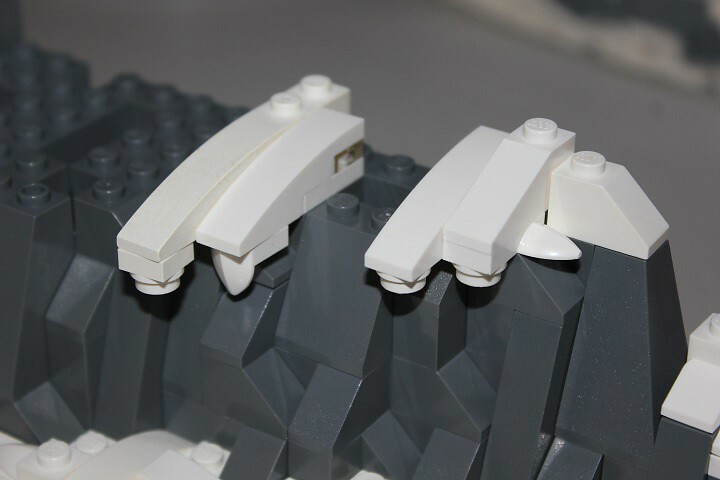 A variety of curved and regular slopes in different sizes are useful to have, but you can make do without lots of fancy parts. Ive begun to step the 2 perpendicular sections together, creating a bit of a convex slope, but trying to keep it nice and smooth. 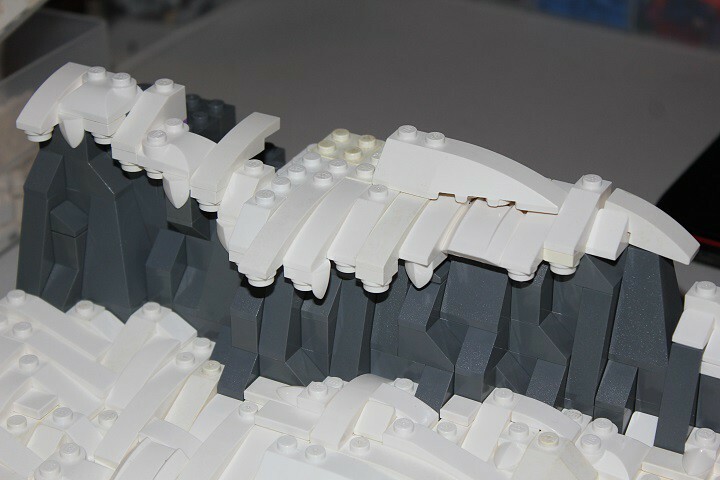 More subtle stepping, and the first section of the drift is nearly completed. Now lets finish off the slope on the right side. 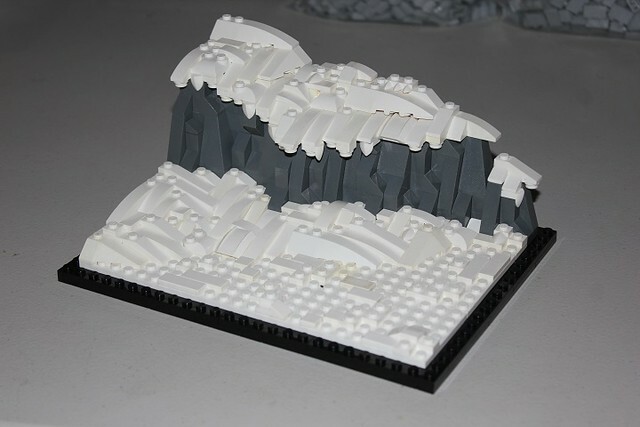 2x4 and 2x6 wedge slopes are really nice parts for snow, and another combination I like to use is horizontal tooth plates over tiles or wedge plates. Ive used that method on the far right here, and also just left of the rightmost 2x4 wedge. 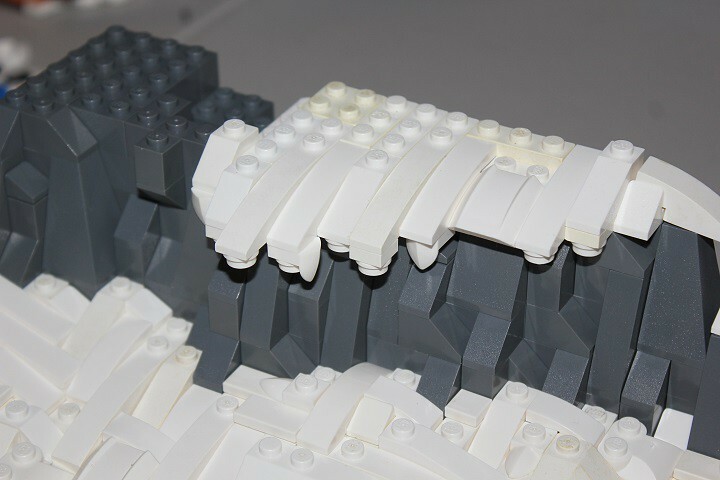 Some small curved slopes, plates, tiles, and cheese finish off the bottom drift. 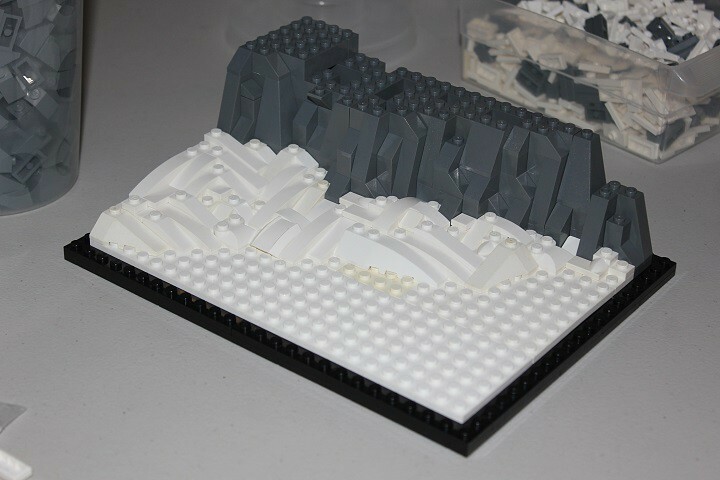 So let's progress onto some deep drifted snow coming over the top of the rockwork. 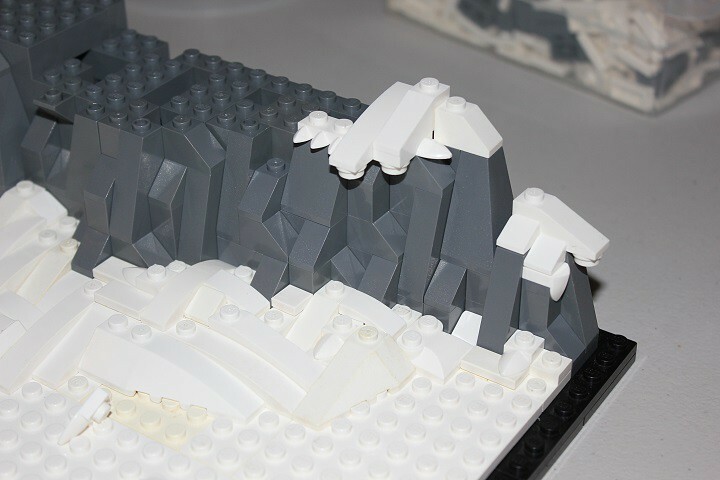 I generally overhang slopes a full stud or two past the rockwork, and then use 1x1 plates and 1x1 round plates to give the hanging snow look. 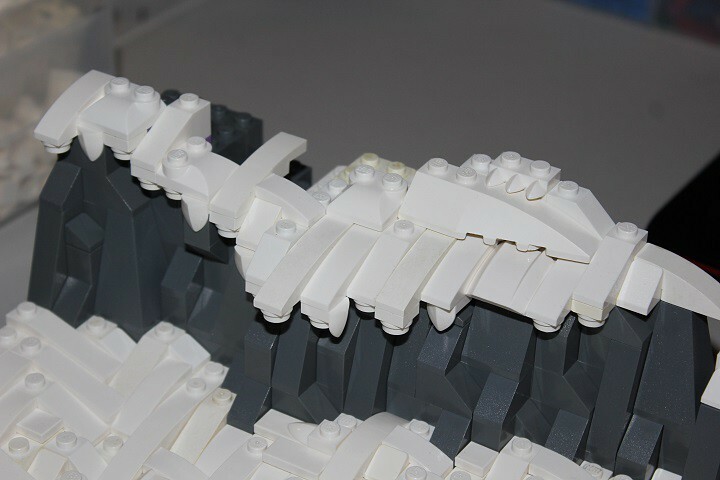 1x1 plates with downwards hanging vertical teeth also work really well in this design. Here you can see clearly how a few of these slopes are attached. 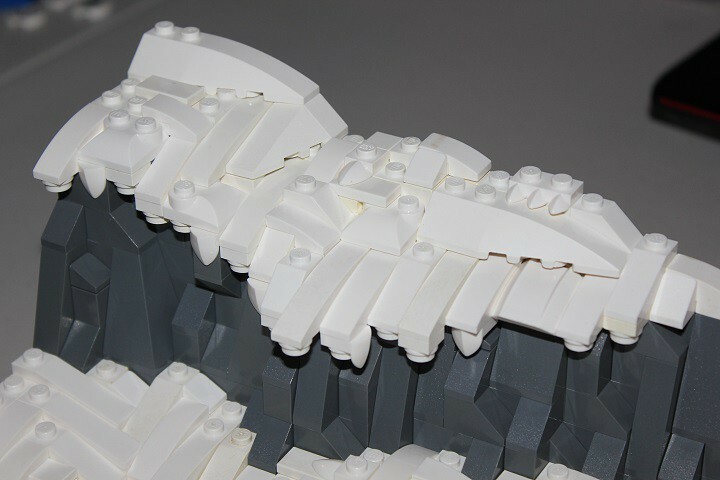 The curved slopes allow for parts to be attached at 1/2 stud offsets along the bottom which I utilized here on the 1x4 slope. Just like with regular drifts, slight stepping is done throughout. White bricks fill in behind, and now I start to step up the end giving some height difference. 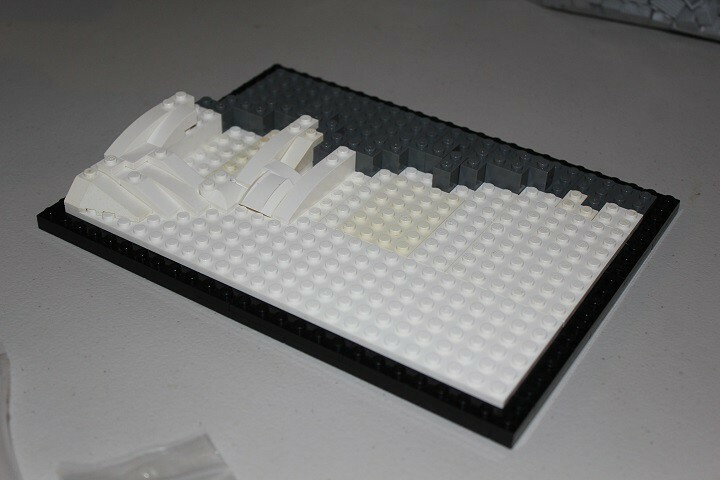 Now the whole front of the overhanging snow has been roughed out, but I need to fill in behind. 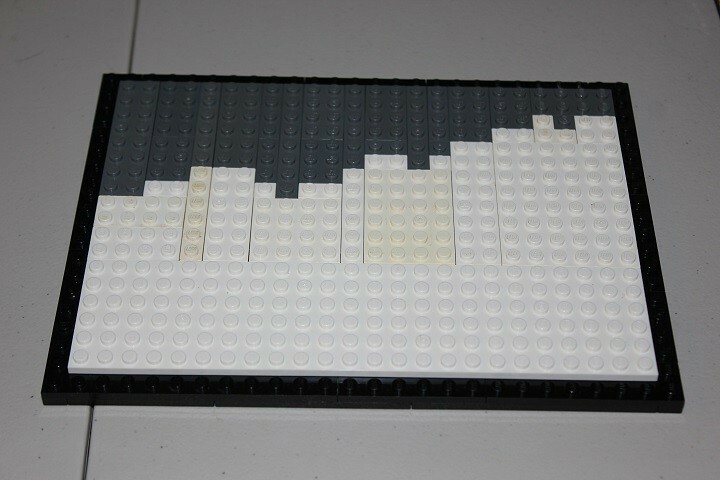 The 2x6 wedge slope going perpendicular to the others gives the look of another drift on top. 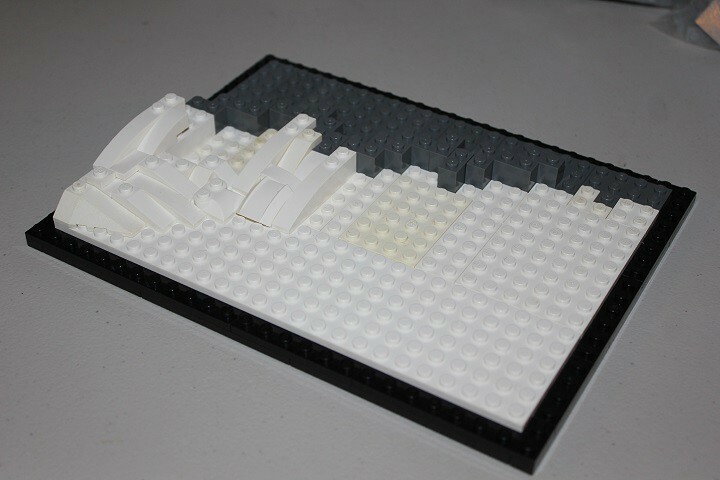 Finished, though the bottom area still has some plain white plates that need detailing. 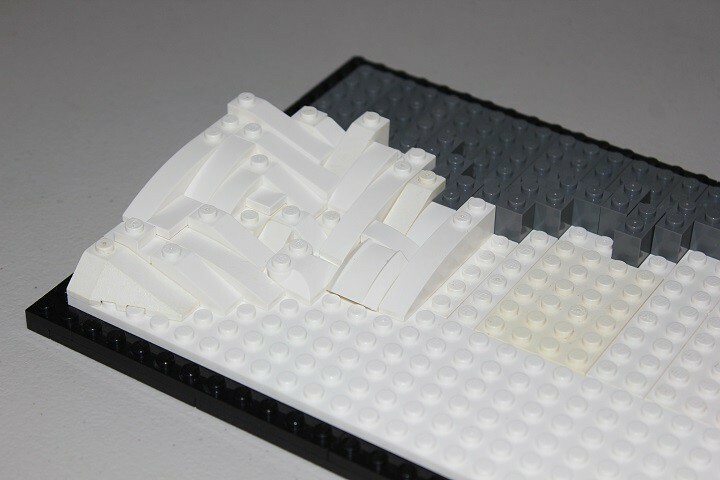 Which brings us to the third method of snow-scapes: texturing flat areas. 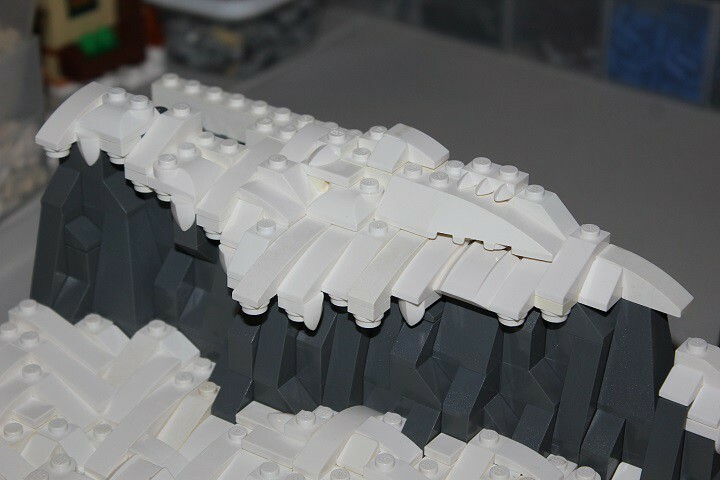 I do this by using small plates and tiles, and even some small slopes now and again. I generally place tiles and plates in patterns of 2, and alternate directions. 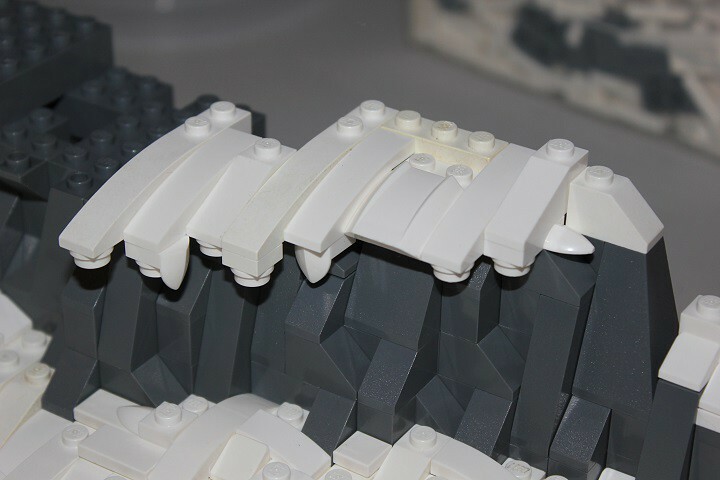 Also trying to avoid overly large sections of bare studs by mixing in tiles. Hopefully this tutorial will inspire you on how to create your own snow-scapes, and be sure to leave a comment if you have any questions or ideas for new tutorials!